This is the web page for the Scratch Club at Independence Elementary School in Yukon, Oklahoma. Thanks for coming out to our Scratch Showcase!! It was fun! Scratch Club Stuff Week of Apr. 29th - May 3rd This week the scratch club will be participating in the "Why Do I Scratch?" creation assignment on the Scratch website. Scratch Club Stuff Week of April 8th - April 12th This week we will be making a guessing game. The kids will be endeavored to create a guessing game for their favorite school subject. Scratch Club Stuff Week of Apr. 1st - Apr. 5th This week the kids will construct a collide game. Scratch Club Stuff Week of March 25th - March 29th This Tuesday, both groups will meet to finalize their projects for our Scratch Club Showcase which will be this Thursday, March 28th at 3:30. Check out the Scratch profile pages of our Scratch Club members! Also check out the cool projects in our Scratch Showcase! For more information check out the video Intro to Scratch from ScratchEd on Vimeo. 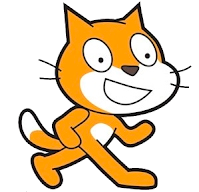 Scratch is a programming language for young people to create their own interactive stories, games, music, and art. Scratch was created by the Lifelong Kindergarten Group at the MIT Media Lab.